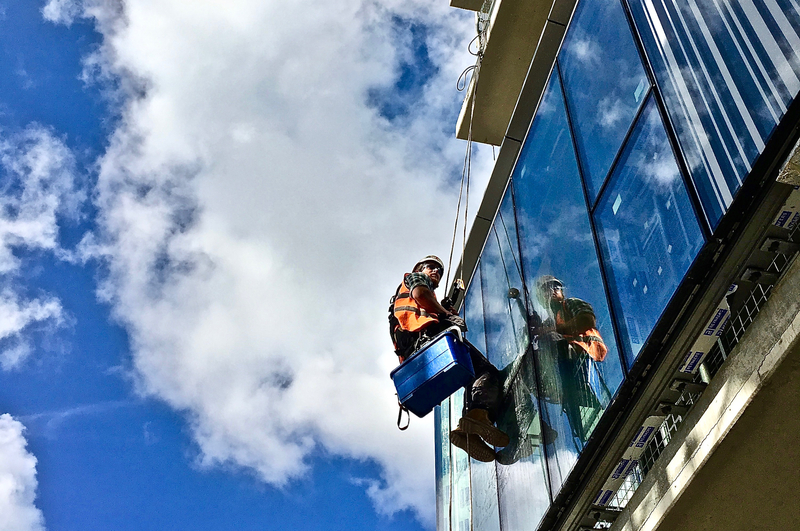 High rise or high level cleaning is when ropes and abseiling equipment are used to perform professional cleaning services in hard to reach areas. Apex Access group provide high rise cleaning services, performed within the health and safety boundaries and fall protection services. It requires training in the safe practice of abseil cleaning, taking into consideration the needs of the clients, the general public, and the technicians. If you have a high rise cleaning project that needs undertaking, you can contact Apex Access group to discuss what may be needed to get the job done. This will include a necessary survey of the premises to see exactly what is needed from our team to complete the job safely and thoroughly. Rope Access Cleaning Services is a method of cleaning at height that has been developed over a 25 year period. It is also used in construction and is known as a safer, less intrusive method of high level work. Scaffolding requires time and is costly to install and takes up a larger working space and area. Ladders involve more risk, and extension poles can’t always reach all the necessary places to give the same level of cleaning required. Allowing access to our team with our high level cleaning solutions, to even the most difficult of areas, means that a job won’t be left half done, therefore making it more obvious when dirt, grime or carbon build up is left undisturbed and untouched. Apex Access Group also use MEWP Access which involves using cherry pickers or Mobile Elevated Working Platforms. This is a highly skilled method that requires a special qualification from our team to operate the appropriate machinery. For more information on the services, we provide please get in touch by calling 01332 229222 or emailing info@apexaccessgroup.co.uk.